Juventus and Napoli fight it out for the Supercoppa Italiana title in Doha on Monday. Juventus are the 2014 Serie A winners and Napoli are the 2014 Coppa Italia winners. In the previous two league rounds, Leonardo Bonucci and Giorgio Chiellini rotated in defence as each served a suspension. The defensive duo will resume their partnership here. Roberto Pereyra is likely to be the 12th man. He'll start from the bench, but is likely to be needed later in the game. Fernando Llorente is favourite over Alvaro Morata to partner Carlos Tevez up front. Juventus finished 2014 in Serie A with yet another victory, which helped them set a new record for points obtained in the calendar year. Saturday's draw between Roma and Milan has also given them a three point advantage at the top of the table, thus improving morale. Rafa Benitez has tried a two-striker system of late which seemed to be working, but the Spanish coach will likely revert to his favoured 4-2-3-1 formation. After much debate over his recent performances and despite the good form of Duvan Zapata, Gonzalo Higuain is expected to spearhead the attack. Jonathan de Guzman has impressed recently, but Marek Hamsik will retain his starting spot for this match. Napoli leapfrogged Sampdoria and Genoa in the race for third place with victory over Parma that ended their 4-match winless streak. The Partenopei have lacked consistency this season, but they remain favourites for the Champions League's playoff spot. The 12 points that separate the two teams in the league is probably an accurate representation of the technical gap between them. Juve have proven to be strong, solid and open to change, tactically. 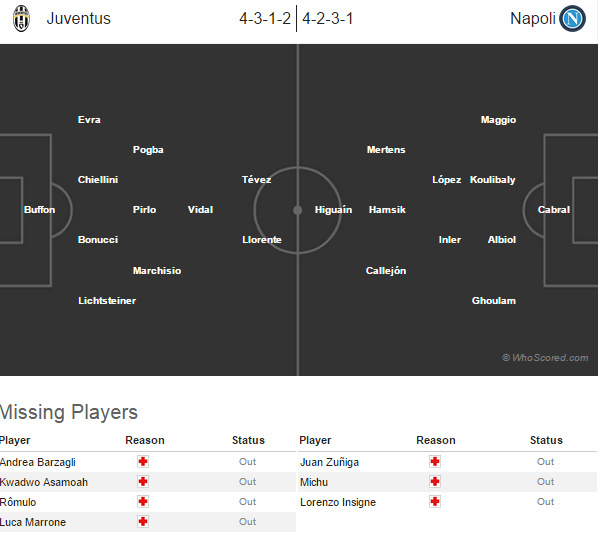 Napoli are unreliable under pressure and too attached to their usual game plan. The azzurri are capable of both effective and entertaining performances, but are inconsistent. Juventus are perhaps not as entertaining, but are very solid. A big game with a trophy at stake could be what it takes for Napoli to concentrate and perform, especially if the tempo is higher than usual. A lower tempo would suit Juventus, as they will probably be able to control the game and push for the win as time wears on.